By 2014, 31.6% of young adults were living with a spouse or partner in their own household, below the share living in the home of their parent(s) (32.1%). Some 14% of young adults were heading up a household in which they lived alone, were a single parent or lived with one or more roommates. The remaining 22% lived in the home of another family member (such as a grandparent, in-law or sibling), a non-relative, or in group quarters (college dormitories fall into this category). It’s worth noting that the overall share of young adults living with their parents was not at a record high in 2014. This arrangement peaked around 1940, when about 35% of the nation’s 18- to 34-year-olds lived with mom and/or dad (compared with 32% in 2014). What has changed, instead, is the relative share adopting different ways of living in early adulthood, with the decline of romantic coupling pushing living at home to the top of a much less uniform list of living arrangements. In 2014, more young women (16%) than young men (13%) were heading up a household without a spouse or partner. This is mainly because women are more likely than men to be single parents living with their children. For their part, young men (25%) are more likely than young women (19%) to be living in the home of another family member, a non-relative or in some type of group quarters. A variety of factors contribute to the long-run increase in the share of young adults living with their parents. The first is the postponement of, if not retreat from, marriage. The median age of first marriage has risen steadily for decades. In addition, a growing share of young adults may be eschewing marriage altogether. A previous Pew Research Center analysis projected that as many as one-in-four of today’s young adults may never marry. While cohabitation has been on the rise, the overall share of young adults either married or living with an unmarried partner has substantially fallen since 1990. In addition, trends in both employment status and wages have likely contributed to the growing share of young adults who are living in the home of their parent(s), and this is especially true of young men. Employed young men are much less likely to live at home than young men without a job, and employment among young men has fallen significantly in recent decades. The share of young men with jobs peaked around 1960 at 84%. In 2014, only 71% of 18- to 34-year-old men were employed. Similarly with earnings, young men’s wages (after adjusting for inflation) have been on a downward trajectory since 1970 and fell significantly from 2000 to 2010. As wages have fallen, the share of young men living in the home of their parent(s) has risen. Economic factors seem to explain less of why young adult women are increasingly likely to live at home. Generally, young women have had growing success in the paid labor market since 1960 and hence might increasingly be expected to be able to afford to live independently of their parents. For women, delayed marriage—which is related, in part, to labor market outcomes for men—may explain more of the increase in their living in the family home. The Great Recession (and modest recovery) has also been associated with an increase in young adults living at home. Initially in the wake of the recession, college enrollments expanded, boosting the ranks of young adults living at home. And given the weak job opportunities facing young adults, living at home was part of the private safety net helping young adults to weather the economic storm. Beyond gender, young adults’ living arrangements differ considerably by education and racial and ethnic background—both of which are tied to economic wherewithal. For young adults without a bachelor’s degree, as of 2008 living at home with their parents was more prevalent than living with a romantic partner. By 2014, 36% of 18- to 34-year-olds who had not completed a bachelor’s degree were living with their parent(s) while 27% were living with a spouse or partner. 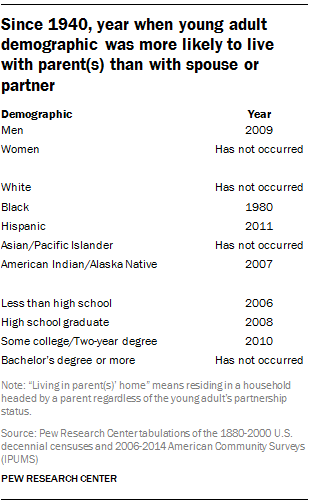 Among college graduates, in 2014 46% were married or living with a partner, and only 19% were living with their parent(s). Young adults with a college degree have fared much better in the labor market than their less-educated counterparts, which has in turn made it easier to establish their own households. Among racial and ethnic groups, record-high shares of black and Hispanic young adults (36% for each group) lived in the home of their parent(s) in 2014. By comparison, 30% of white young adults lived at home. White young adults are more likely to be living with a spouse or partner (36%). But the trends are similar for all major racial and ethnic groups including whites: Since 1960 a greater share are living at home and fewer are married or cohabiting and living in their own household. For black young adults, living with mom and/or dad is now the most common arrangement, as only 17% were living with a spouse or romantic partner in 2014. For Hispanic young adults living with parent(s) is also the dominant arrangement as 30% were living with a spouse or significant other in 2014. Generally, young adult blacks and Hispanics lag behind young whites both in terms of educational attainment and employment status. This report presents the historical trends in the share of young adults who live with their parent(s). The first section presents a simple classification of living arrangements. The second section examines trends in living with parents by demographic and geographic groups. The third section explores the shift away from living with a romantic partner and toward living with parents. The final section examines the relationship between living with parents and trends in the labor market opportunities of young adults. •	The growing tendency of young adults to live with parents predates the Great Recession. In 1960, 20% of 18- to 34-year-olds lived with mom and/or dad. In 2007, before the recession, 28% lived in their parental home. •	In 2014, 40% of 18- to 34-year-olds who had not completed high school lived with parent(s), the highest rate observed since the 1940 Census when information on educational attainment was first collected. •	Young adults in states in the South Atlantic, West South Central and Pacific United States have recently experienced the highest rates on record of living with parent(s). •	With few exceptions, since 1880 young men across all races and ethnicities have been more likely than young women to live in the home of their parent(s). •	The changing demographic characteristics of young adults—age, racial and ethnic diversity, rising college enrollment—explain little of the increase in living with parent(s). A “young adult” is an adult ages 18 to 34. An adult is “living with parent(s),” “living at home,” or “living in parent(s)’ home” if the adult is the child of the household head. The household head could be the mother or father. “Cohabiting adults” refers to household heads with an unmarried partner and the unmarried partners of the household head. An unmarried partner of the household head, also known as a domestic partner, is a person who shares a close personal relationship with the household head. Cohabiting young adults in which the couple does not include the household head are not identified as cohabiting and are categorized in other living arrangement categories. An adult is “living with a spouse or partner” or “married or cohabiting in own household” if one member of the couple is the head of the household. An adult is “college-educated” if the adult’s highest education is a bachelor’s degree or more. A “not college-educated” adult refers to an adult whose highest education is less than a bachelor’s degree. References to white, black, Asian and American Indian young adults include only those who are non-Hispanic. Hispanics are of any race. Asians include Pacific Islanders. American Indians include Alaskan Natives. The New England census division comprises Connecticut, Maine, Massachusetts, New Hampshire, Rhode Island and Vermont. The Middle Atlantic division: New Jersey, New York and Pennsylvania. The East North Central division: Illinois, Indiana, Michigan, Ohio and Wisconsin. The West North Central division: Iowa, Kansas, Minnesota, Missouri, Nebraska, North Dakota and South Dakota. The South Atlantic division: Delaware, District of Columbia, Florida, Georgia, Maryland, North Carolina, South Carolina, Virginia and West Virginia. The East South Central division: Alabama, Kentucky, Mississippi and Tennessee. The West South Central division: Arkansas, Louisiana, Oklahoma/Indian Territory and Texas. The Mountain division: Arizona, Colorado, Idaho, Montana, Nevada, New Mexico, Utah and Wyoming. The Pacific division: Alaska, California, Hawaii, Oregon and Washington.